The historic turn-around tree was a memorable white oak that was centered in the driveway of the Baron family’s home place. When age and disease caused it to topple, the family knew they wanted to save the lumber and create a custom piece of furniture to preserve their memories. The wood was cut into 10″ x 12′ boards that were carefully air-dried outside my workshop. After a few years of thinking what would be appropriate, the Barons decided I would design and build them a ten foot table that could sit the extended family. The limits of my shop equipment and space were challenged. The rough-cut lumber took considerable preparation before the table could be constructed. Because of the length of the table, I was just barely able to run the boards through my table saw and jointer. I designed the table with a trestle base so the table could seat as many as they wanted without leg interference, a rail that could be knocked down for easy transport, and breadboard ends on the tabletop for a classic look. 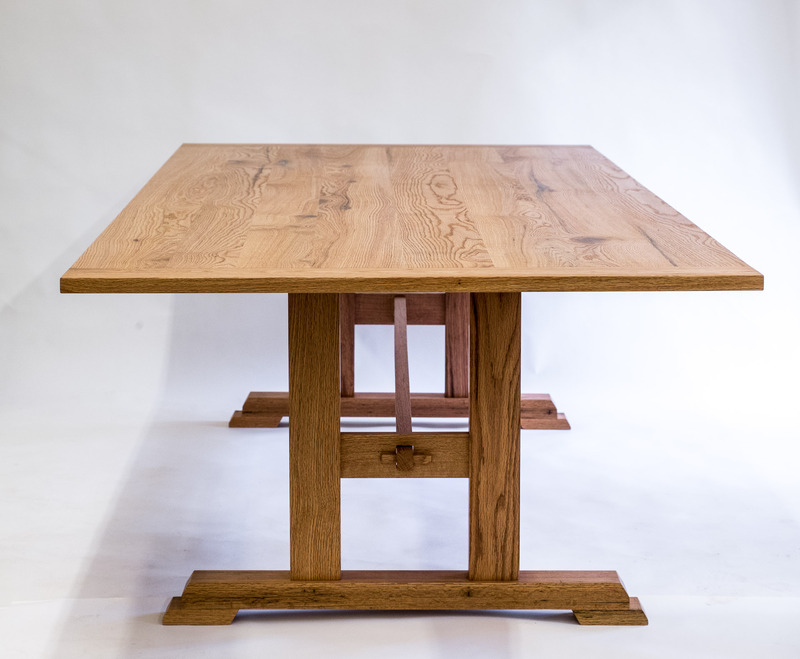 The resulting trestle table highlighted the character of the wood, and provided a sturdy dining table that will be used for many generations to come.